Total weight gain: I forgot to weigh myself this morning...I will update again next week! But I did take measurements! Right now my waist is at 28" and my belly is at 33". My pre-pregnancy (meaning pre-first pregnancy) measurements were 34"-24"-34" and my postpartum waist measurement was 25" on a good day. Best moment this week: It was not a great week to be honest...the weather has been really crappy and I think it's affecting my mood. Anything making you queasy or sick: Not right now. Gender: I definitely feel girl! For some reason I'm seeing Emilia with a little sister...I mean maybe I'm wrong but this is how I'm feeling! We finally picked out a girl name that we like, just in case. It was difficult because of course Emilia was our first choice and we already have our boy name! But I'm happy with both names we have picked and will be excited to use either! Happy or moody most of the time: Definitely moody. Looking forward to: Feeling like a normal person again...ha ha ha! Want to compare last my last 14 week update with this one? Click here! 13 Weeks Pregnant with Baby #2! How far along? 13 weeks 1 day! My due date was pushed back by exactly one week to March 31st which is why I didn't do a second 12 week update last week! Now I am officially into the 2nd trimester which is crazy...I feel like even though the 1st trimester was awful symptoms wise, it went so fast! Total weight gain: Gained 3lbs in the past 2 weeks! I am now 123lbs which is actually exactly the same as what I was this time last pregnancy (even though I look way bigger!). That means I've gained a total of 8lbs since the beginning of this pregnancy. I'm not going to lie, the last 2 weeks have been rough getting to terms with the weight gain being that all the books, websites, forums etc. tell you that the "normal" amount of weight you should gain in the 1st trimester is up to 5lbs! I just feel like it's piling on so fast & I'm showing so much more...does this mean I'm going to have a huge baby?! But now I feel a lot better about it and I know every pregnancy is different - what's most important is that the baby is healthy! Maternity clothes? Yep, yep, yep! This dress I'm wearing is a maternity dress from Benetton that I got last pregnancy and the leggings are not maternity but they have a good amount of stretch in them. Sleep: Not great :( I think the dreaded pregnancy insomnia has begun now that my bump is a bit bigger and it's getting more & more uncomfortable to sleep! I may have to break out my pregnancy pillow again. Food cravings: I didn't notice any real cravings this week, though I will say I'm definitely liking meat a lot more than normal. Gender: I have a feeling it's another girl for some reason! Don't ask why...I would be happy with either to be honest! But I just can't imagine having a boy - I would be really surprised if it was! Symptoms: Bloating & constipation have been the worst these last two weeks :( It seems like both are letting up a bit now though so I am definitely thankful for that! Otherwise my nails are still splitting and very weak (total opposite to last pregnancy!). Happy or moody most of the time: Errr a bit of both! My emotions & hormones have been all over the place lately! I seem to cry at the drop of a hat...it's kind of embarrassing!! 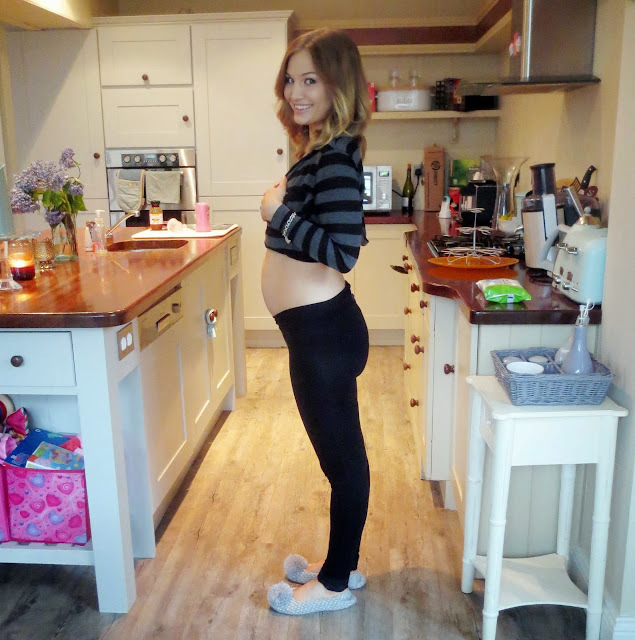 To compare this pregnancy's 13 week bump to the last one, click here! I am finally getting around to writing Emilia's 12 month update! This will probably be it until about 18 months, as my initial goal was just to document her first year. But I will probably update again when she is a year and a half, as I'm sure lots will have changed by then! Height/Weight: Emilia weight about 22lbs (from when I weighed her last month) and is between 27 and 28 inches in height. It's quite difficult to get her to stand still so I'm estimating that she is maybe 27 and a half inches! 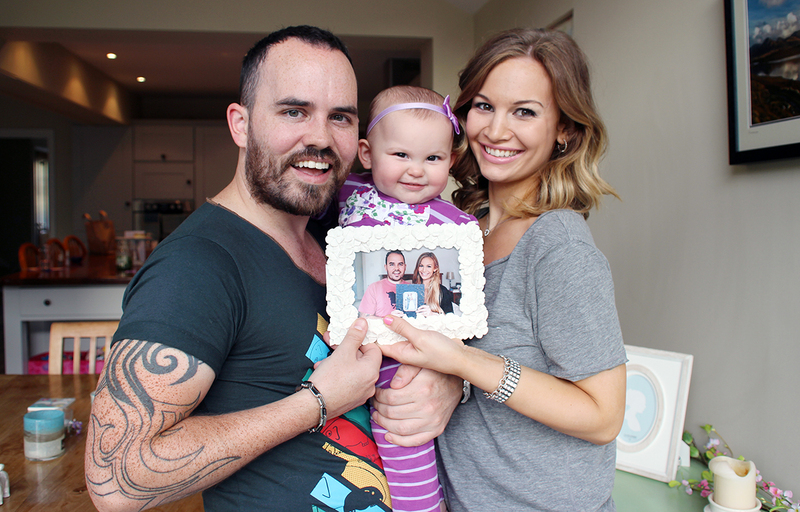 Sleeping: Emilia still sleeps through the night in her own nursery with the door shut. We actually stopped using the AngelCare sensor mat as the alarm kept going off and scaring us half to death in the middle of the night...the reason for this is because her crib is quite big and she moves around a lot, so she would move off the mat and it would freak out! So now we just use the monitor in her room for when we are downstairs in the evenings, otherwise we have it switched on but don't even bring it upstairs with us when we go to bed as we can hear her anyway through our wall (our bedrooms are right next door!) In terms of naps, on an ideal day she will go down from 12-2pm. Bedtime is between 8 and 9pm. For breakfast she still has organic porridge or Weetabix with whole milk & honey along with a piece of fruit, like a banana. With breakfast and lunch she just drinks water but sometimes she gets orange juice with her porridge if we have it in the fridge (it never lasts long!!) For lunch she usually has a wholegrain chicken/tuna/egg salad/ham & cheese sandwich with lots of veggies like cherry tomatoes, cucumber, avocado and some babybel cheese. For dinner she eats whatever we're eating along with whole milk to drink and for dessert she usually gets an organic yoghurt/fromage frais and some fruit. For her afternoon snack she normally eats cheese & tomato puffits and 1/2 an apple or whatever other fruit we happen to have in the house. (This is the same as last month.) When we're out or if we're at my mom's house she does usually have something sweet for dessert like a bit of cake or ice-cream or a cookie. I believe in everything in moderation...I've practised this with Emilia since the beginning...I have never banned anything completely as I don't want her to grow up associating certain foods with being "bad" or "good", simply "more satisfying" or "healthier". But everything is allowed, just in regular and proper portion sizes. 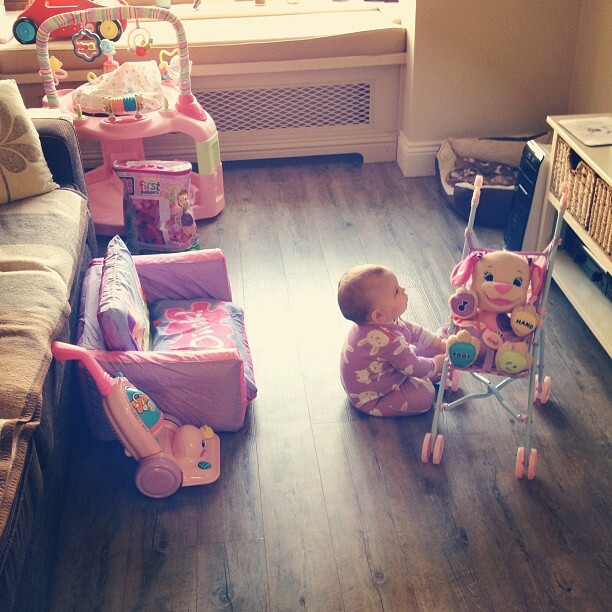 Sizes: Emilia is wearing 12-18 months clothing and size 4+ nappies. We're still using Pampers Active Fit or Baby Dry and we have always been happy with those! She is now WALKING!! Yesterday she took her first steps!!! To be totally honest her very first steps were not that dramatic...I saw her take them out of the corner of my eye, when I was putting away toys in her room and she suddenly took two steps on her own from her rocking chair to a toy she wanted. Then she did it again when she walked from the couch to the TV and at that point I decided, alright we need to document this!! So Jonathan and I filmed her practising walking between the two of us. Above is the thumbnail from the instagram video I took! She is articulating her words a lot better and also has her own little ways of saying things! For example she says "dada" or "daddy" in the morning when I bring her in to see him, she says "mama" when she's tired or wants me, she says "dudden" a LOT (this can actually mean a few different things) which normally means "doggy". She has a little sound she makes when she's saying "bold" (bad), it's like a "gnnn" sound at the back of her throat and she will say that when she does something she knows isn't allowed or if she's hitting me or the dogs with a toy (something she also knows is not allowed...ha ha ha!). That is everything I can think of! If you have any questions about anything I mentioned, please let me know in the comments & I will try to reply! Sorry I haven't posted in the last two days, but I have been sick :( I caught Emilia's cold the night before her party...what a disaster! Luckily neither of us were feeling too bad on the day and we were still able to go ahead with it. Emilia was quite sniffly but she is such a trooper - it didn't seem to affect her mood at all! 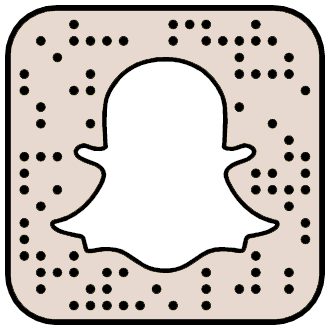 So here is the long-awaited party post! As you probably already guessed, we went with a Peppa Pig theme ;) Emilia is obsessed with Peppa...everytime she sees her whether it's on the TV screen or in toy/picture form her face lights up and she gets ridiculously excited! And whenever she hears the theme music she starts rocking back and forth like crazy! I'm serious, the creators of Peppa were definitely onto something...it is like a drug for kids! Above is how our dessert/display table looked! 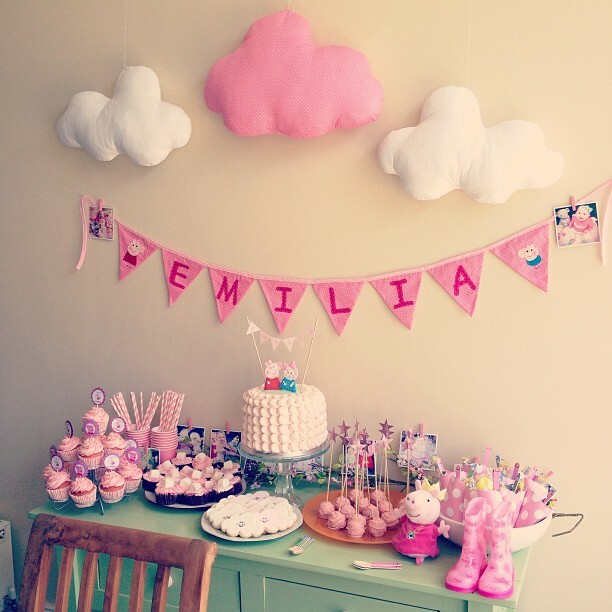 The fabric clouds and Peppa & George "Emilia" banner were custom made by Craftaholic on Etsy. I found the banner first and loved how personal it was - then I asked the shop owner if she could make the clouds having seen something similar on Pinterest and she said yes! I am so happy with them and will be using everything in Emilia's nursery when the party decorations are taken down. I also got some pink & white paper straws from Fancy That Loved on Etsy. 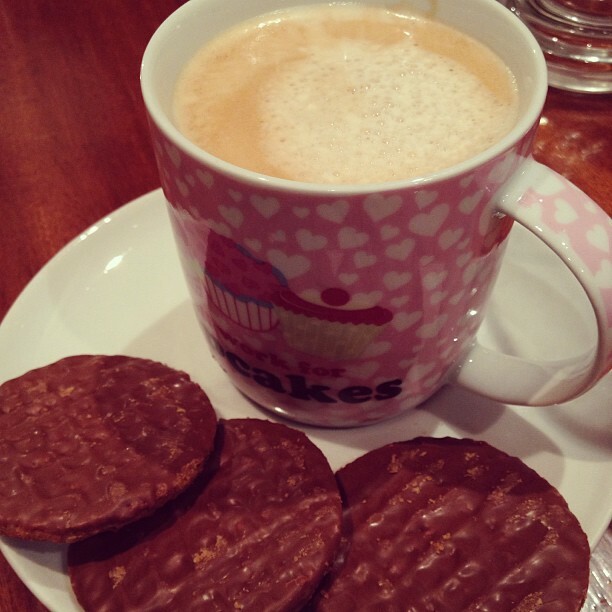 They were amazing quality and very thick! The bunting/cake topper is from The Path Less Traveled on Etsy. I love how delicate & personal this was, I actually didn't want to spoil it with candles!! Unfortunately you can't really see it in this picture but Emilia was wearing a beautiful peach tulle dress by Billieblush. 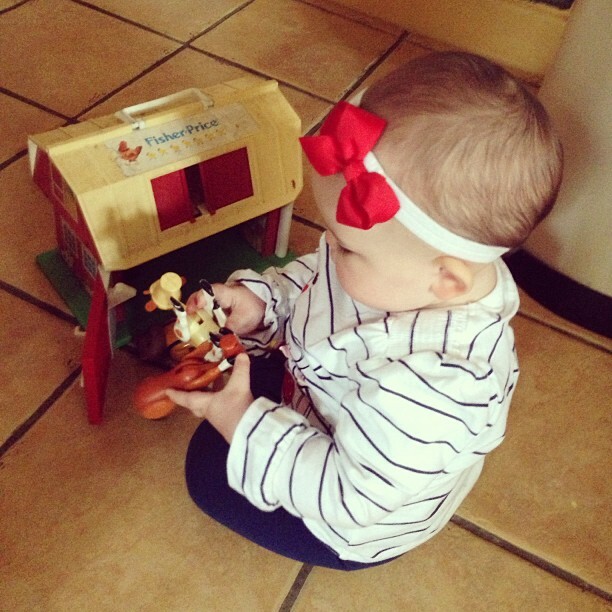 Her headband was by Layniebug Designs & Peppa Pig bow was from Heather's Bonny Bows. 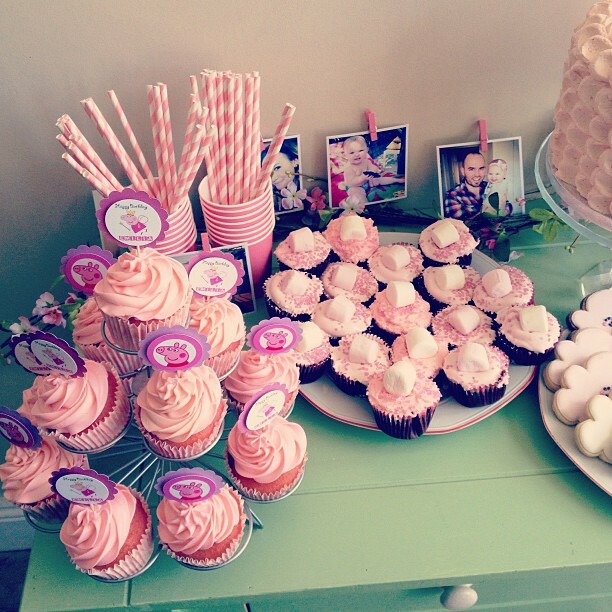 My cousin Esther also baked the pink cupcakes (they were vanilla with buttercream frosting again...drool!) and I got the Peppa Pig customised cupcake toppers from Unique Party Supply on Etsy. My sister Emma baked the chocolate marshmallow cupcakes which were delicious and had pink frosting & sprinkles on top. I decorated the back of the table with a pink flower garland which I bought a few months ago from The Pavilion Garden Centre with pictures of Emilia printed from Printstagram and held up with little pink wooden clothes pegs from Skull Buttonry on Etsy. 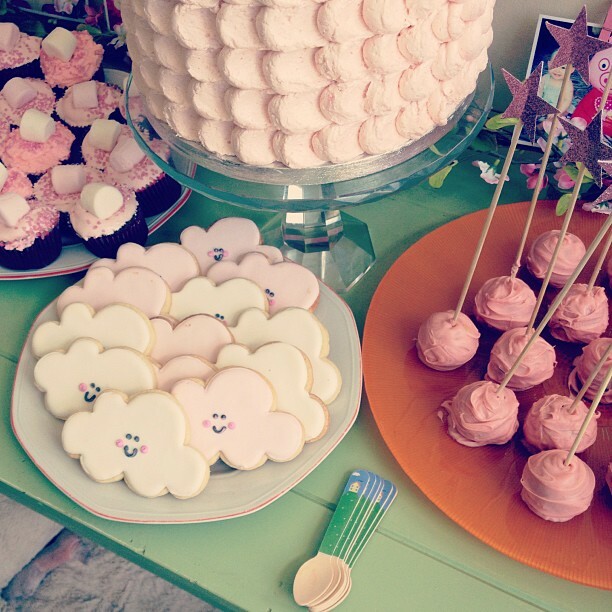 More treats at the party included these adorable cloud cookies and pink star wand cake pops, all baked by my cousin Esther. She got the idea of the cloud cookies from Sweetopia and I think they look so sweet! Emilia loved their little smiley faces :) The cake pop wands were also made by The Path Less Traveled on Etsy. We used plastic knives & forks for the most part but I also found these wooden Peppa Pig teaspoons and decided to get some just for fun! They are from Bespoke Party Products on Etsy. I also included them in the kids' goody bags - blue and green for the boys and pink for the girls! For the goody bags, I used pink polka dot paper bags from Suzie's Cards on Etsy and filled them with treats we bought in the party supply section of Woodies. 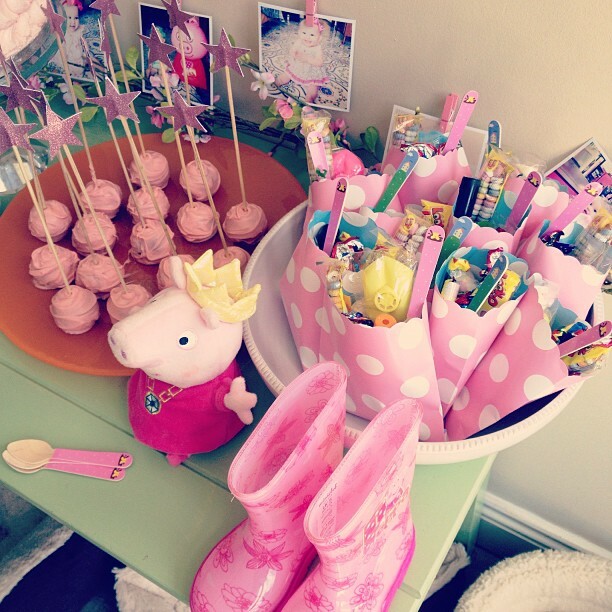 Princess Peppa was also on our display table along with her wellies for jumping in muddy puddles ;) We bought the pink paper cups & plates from Tesco and the Peppa Pig themed ones from Smyth's Toy Store. Throwback Thursday: Pre-Baby Body & Some Food for Thought! But yes, I would very much like to start working out again after little No Name Saccone Joly arrives - in the meantime I intend to *try* and keep up my fitness level by walking a few times a week (so far this is failing miserably...but hopefully the second trimester energy boost will kick in soon!) In all honesty though, this entire post feels horribly shallow, especially given the fact I'm conscious Emilia had the sniffles & runny nose all day and just now I had to give her Calpol as she had a temperature and was very snuffly tonight :( There is a total shift in priorities once you have kids that nobody can fully prepare you for. And while I am the first to admit that I still fully enjoy making an effort with my appearance & by no means do I have any intention to "let myself go" (don't panic, Jonathan!!) things that once held so much importance like a bangin' body or a tiny waist are nothing compared to the health or happiness of your baby/ies. What I'm trying to say is...there are more important things to life than having a six pack or a "thigh gap" (I actually didn't even know what that was until a few days ago...) And although of course I would love to get my pre-baby body back someday, it's just not at the top of my list of priorities anymore and it's also not something I would risk damaging my health over. So please bear with me as I continue to share imperfect pictures of my current self and remember to hate less & love more...whether that be yourself or someone else. Because life is too short to spend under your own little cloud of negativity and critiquing other women's bodies. What's important is that you are happy with who YOU are, it doesn't matter about anybody else. I hope this post has inspired you in some way or another!! I did not expect to get that deep...but it's the middle of the night and I tend to get inspired at the most random times like this...oh well :) Love and positive vibes to all of you! It's official...I have a 1 year old! Eek! I can't believe it! My little baby is technically no longer a baby but a toddler! (Even if she hasn't quite mastered the art of toddling yet!) Here are a few pictures from Emilia's big day. Her reaction to all of her presents & cake in the morning was so cute...I think she was excited but a bit overwhelmed! A better look at the cake I made...I ended up staying awake till 2am baking, frosting and decorating it! But it was so worth it :) I just baked a basic yellow cupcake and buttercream frosting recipe for 24 cupcakes from my Betty Crocker book. 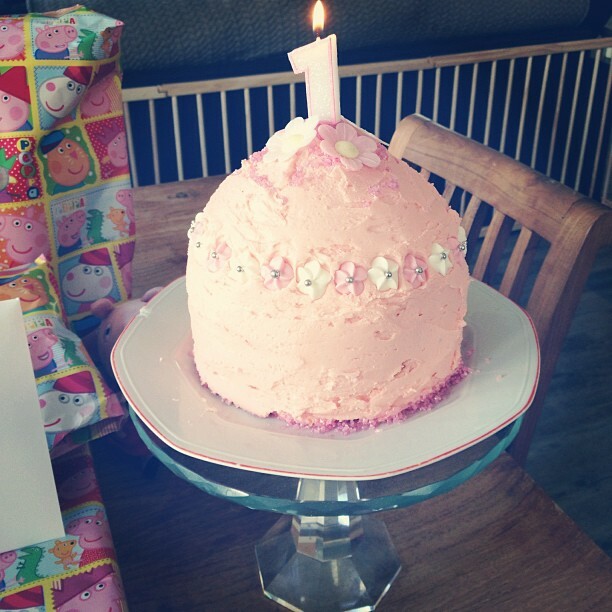 I tinted the frosting pink with food colouring and used my Big Top Silicone Bakeware to make a giant cupcake. I baked it in the oven at 175 degrees Celsius for about 45-50 minutes and then frosted it & decorated with Dr. Oetker edible paper flowers and sugar flowers around the top. After her nap we went Emilia's Oma's house for lunch and she got to unwrap even more presents! She loved everything, especially the cards! 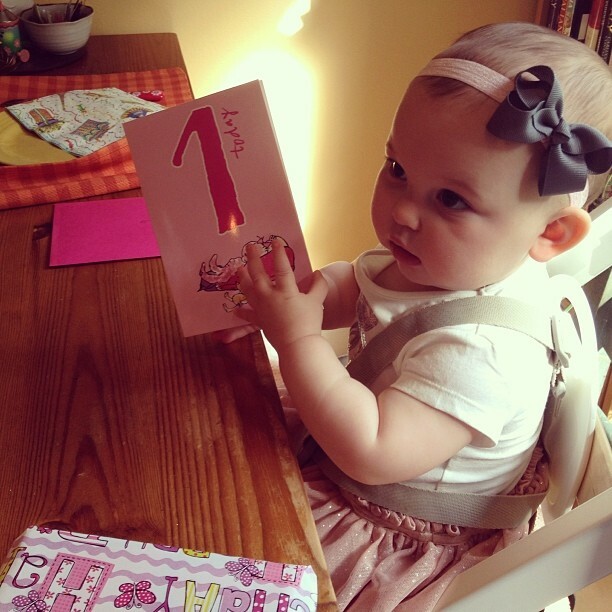 I think she thought the cards were books...what a cutie! And this was her beautiful birthday outfit - the dress is from Billieblush in Brown Thomas and the cardigan is by Bonpoint. 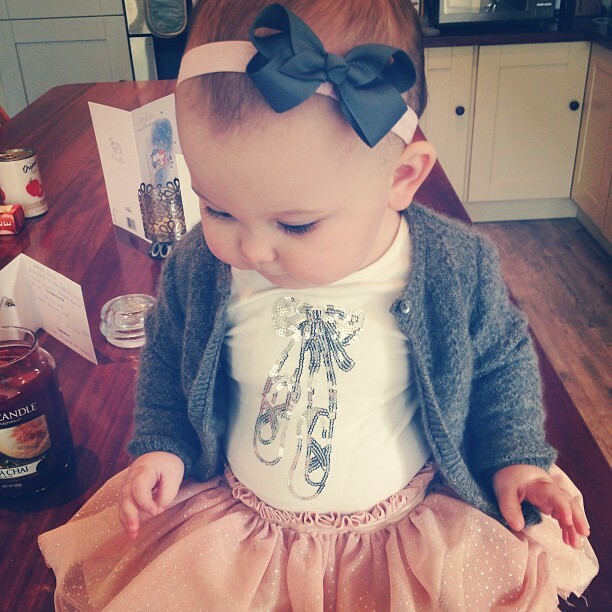 She is wearing the slate grey bow and light pink headband from Layniebug Designs. You can't see her shoes but she wore her white leather bow shoes from Next. 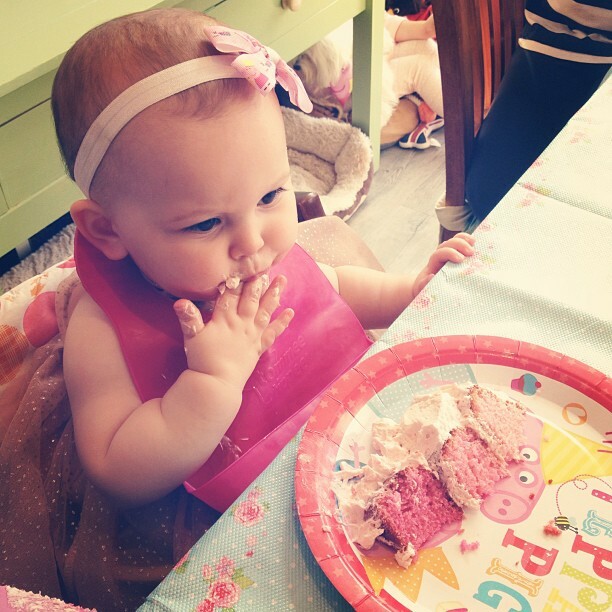 I really hope Emilia had an amazing 1st birthday - all I know is that she was absolutely shattered by the time bedtime rolled around so I think I will chalk that up to being a success! Now I am bracing myself for her birthday party on Saturday...and praying for good weather! Happy Birthday princess Emilia, you are the best little girl your mama could ever have wished for! The birthday preparations are underway! 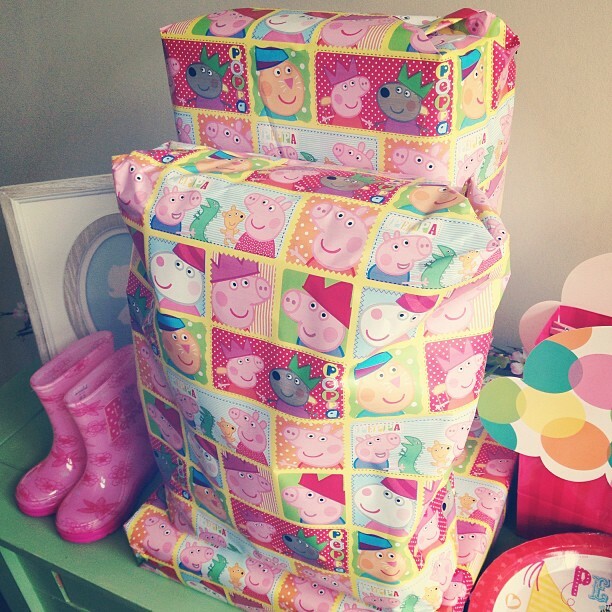 Here's what my house is beginning to look like...basically it's as if Peppa Pig just vomited all over it, ha ha ha! I'm staying up late tonight to prepare Emilia's cake...right now it's cooling in the fridge so I can frost and decorate it. I've also set up her place at the table for when she comes down in the morning :) I am so excited! My mom always had this tradition where she'd set up our places on the morning of our birthday with our presents, cards, cake & candles...even on a school morning! We weren't allowed to come down from our room till everything was ready and it was always a lovely surprise. Even now that I'm grown up & moved out of home I still miss those birthday mornings. So it's really important to me that I continue this tradition with my family too! We also had our 12 week scan today! This time around the baby was extremely active! He/she was kicking and moving like crazy - I actually got a fright when I saw that, I was not expecting it as last time the baby was so tiny and still! We got to hear the heartbeat which was amazing :) And I got a new due date! So even though I was technically there for my 12 week scan the computer put me at 11 weeks 1 day so I am one week behind where I thought I was and my new due date is March 31st! 12 Weeks Pregnant with Baby #2! Sorry the lighting is so bad in these pictures - it's started to get really dark here again in the afternoon! :( It seems I need to take all my blog photos earlier in the day from now on! How far along? 12/11 weeks - am saying 12 but still not sure if it's changed or not. Will find out at tomorrow's OB appointment. Stretch marks? No new ones! Been using Mama Mio Tummy Butter every night on my belly to prevent them. Miss anything? Not at the moment but I know that soon I will miss sleeping on my tummy! Those days are numbered...I can tell :( I am a total tummy sleeper and that was one of the worst things about pregnancy last time. Right now I am sleeping this way as much as possible to get the most out of it, ha ha! Food cravings: HOLY sausages!!! Anyone who knows me knows that I am not a big meat-eater...in fact, red meat is usually a no-go for me as I generally find it gross. But this week I developed these extremely strong cravings for sausages...sausage rolls, meat balls, any kind of pork sausage, especially with ketchup. OMG. I think I'm turning into a sausage! The funny thing is our treat cupboard is overflowing with cookies, cake, chocolate, etc. which NEVER happens as I normally have such a sweet tooth. I just haven't been feeling the sweets lately. Not like me, at all! Symptoms: Morning sickness is definitely gone - phew! And my energy is slowly but surely coming back. I have days where I feel totally normal and like "myself" and then some days I still get super tired. So it varies! One thing I forgot to mention in my video (and brace yourselves for TMI here...) was constipation :( Unfortunately I do remember this symptom from last time. I think the prenatals tend to add to that :-/ Sam recommended Weetabix so I bought a humongous pack of it and I intend to mill through it next week...ha ha ha! Looking forward to: Our 2nd ultrasound tomorrow :) We get to see little No-Name again! 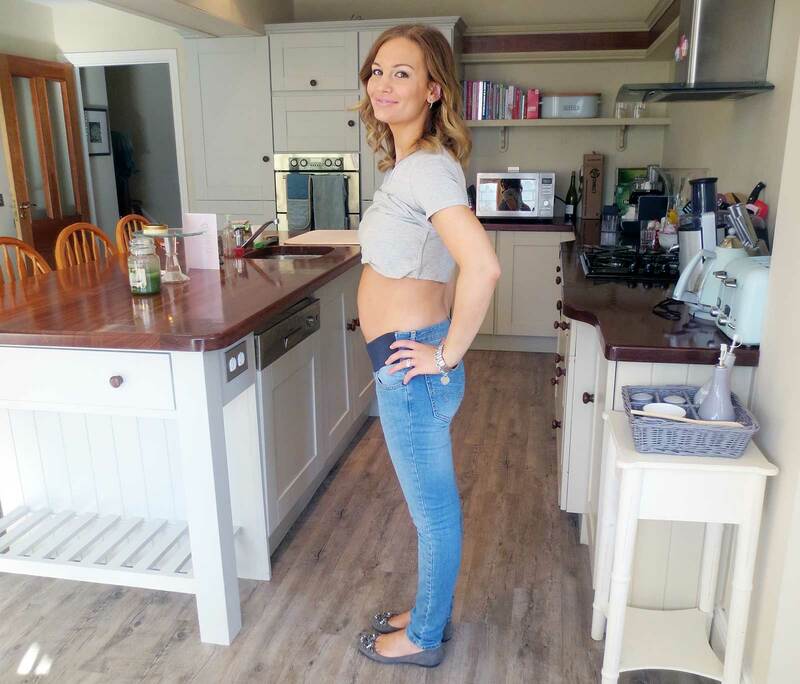 If you want to compare this week's bump with my 12 week update from when I was pregnant with Emilia, click here! 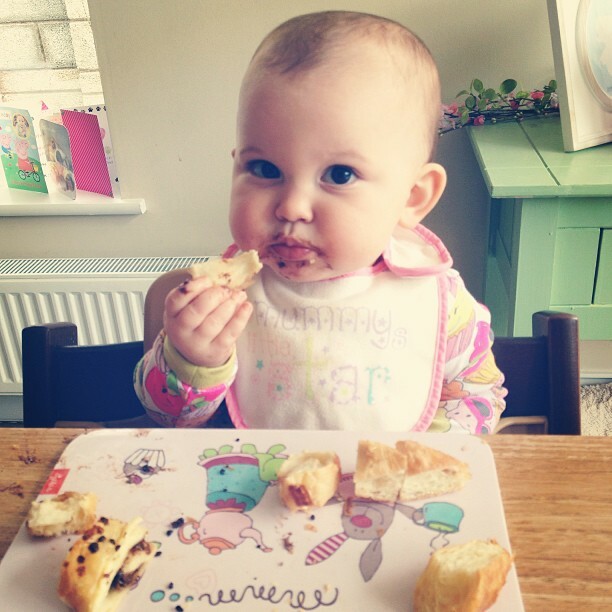 Emilia enjoyed her croissants too! She actually got half a chocolate one & half a plain one (we all know she's going to be a chocoholic like her daddy!). We bought her birthday presents this afternoon and hid them in the car so she doesn't see them till the big day! I am so excited for Wednesday but a little bit sad at the same time...I don't know if it's the pregnancy hormones or is this just normal mommy feelings but everytime I think of her turning one I start to tear up! I can't even explain it - I just can't believe how much she has changed and grown in the short space of one year. I know everybody says it but the first year goes so fast and before you know it your tiny newborn baby is a cheeky little toddler with a personality of their own. And you're left reminiscing and sobbing like a crazy person...ha ha ha! Bracing myself for an emotional & busy week! Banana Bread & Barnyard Animals! I baked banana bread last night for Emilia's (and my ;) breakfast and she loved it! 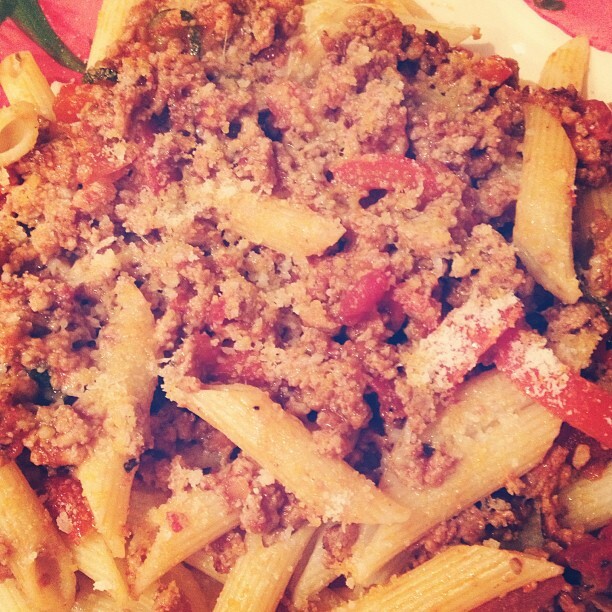 I used Annabel Karmel's recipe from her Eating for Two book. I am a fan of banana bread anyway...I used to love when my mom made it but I have to say I really like this recipe too! 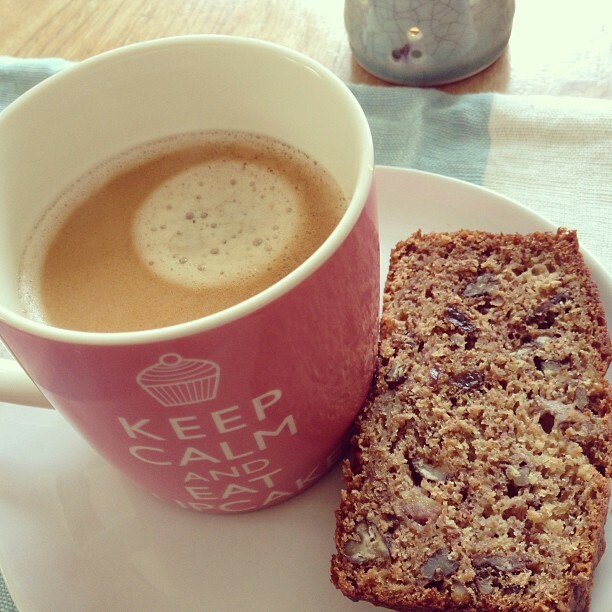 It's made with pecans & raisins - delicious! 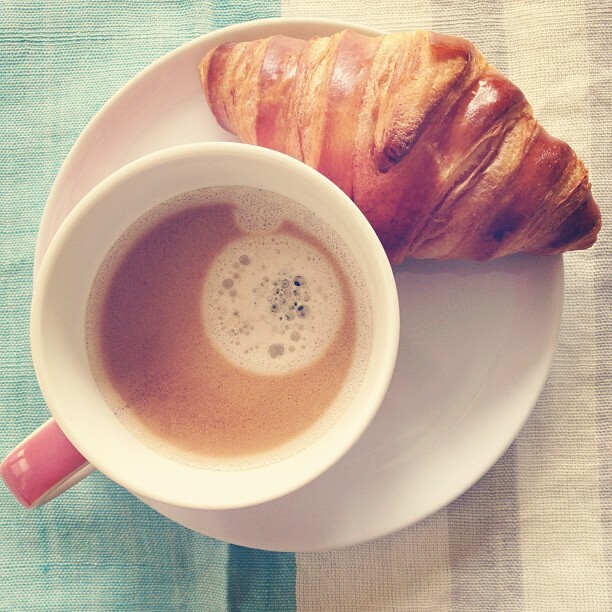 I had it for breakfast this morning with a coffee :) Yum! I also practised some more driving today which I'm quite proud of! Although it took me about 25 minutes to reverse park into our driveway (embarrassing...I pray to god none of my neighbours were watching!!). And I had a little mishap with a video I filmed yesterday when I accidentally deleted it from my SD card. Unfortunately it's gone forever :( So that's why there was no video today! Oh well, these things happen. Emilia & I visited my mom this afternoon and she got to play with my old toys from when I was little! This Fisher Price barn was one of my absolute favourites...I can't believe my mom kept it and all of the animals too! The door makes a "moo" sound whenever you open it - did any of you have this farmyard set too?! 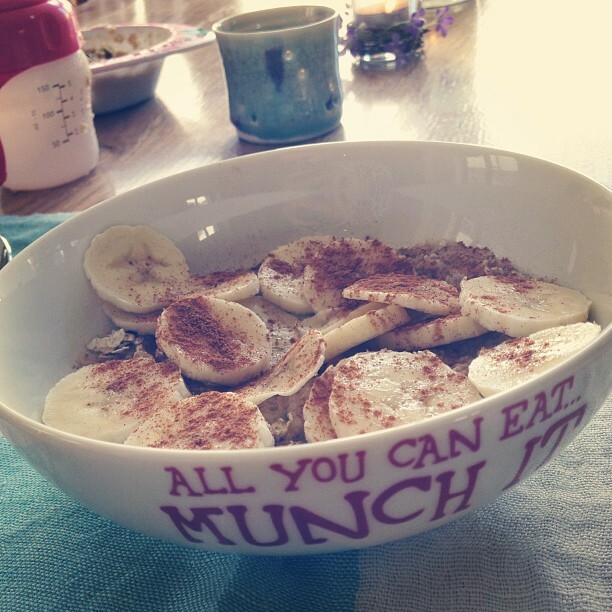 Good night from my bed to yours :) And if you want to try the banana bread I made, you can find the recipe here! Here's what I wore today...I've been feeling a lot better lately, thank god! The worst of my morning sickness seems to be over although it feels like my bump has doubled in size! It's not visible at all in this picture because of the angle but trust me...it's true! I think I look like I did 20 weeks pregnant with Emilia! I love this GAP cardigan so much for autumn and seeing as today was a little chillier I took the opportunity to break it out. The shirt is by Tommy Hilfiger (old - have had it forever) and the jeans are by Zara. My leopard print ballet flats have a gold chain detail at the toe and were from New Look...these are also extremely comfortable! My bangle is by Farrell & Brown which you can buy at Meadows & Byrne. 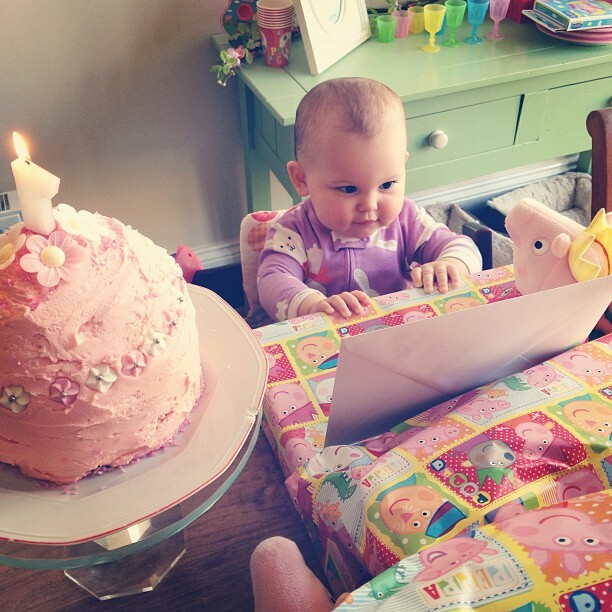 I can't believe on my next birthday Emilia will be over ONE year old! 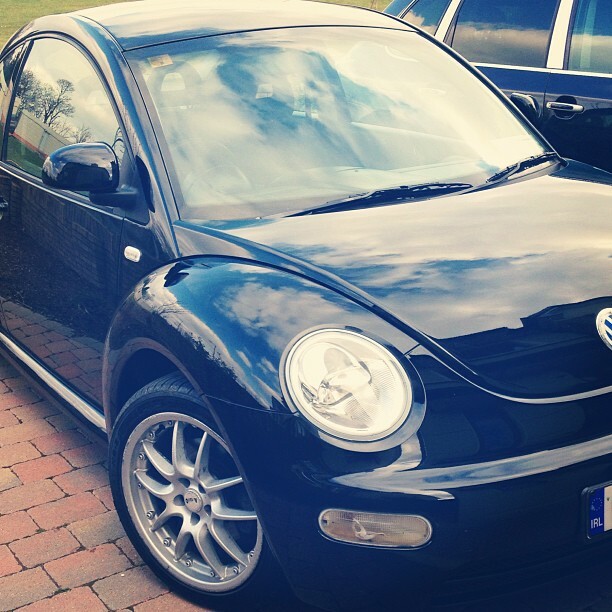 Today I had my tenth driving lesson! I am finally getting used to driving on the road...although I feel like every lesson takes so much concentration & energy out of me that by the time the hour is up I need a nap to recover! I'm not sure if this also has something to do with the fact that I'm pregnant or not! So far I have driven all around the areas closest to where I live, into town and just today I tackled a multi-storey car park with a scarily tight winding entrance...I also did some reverse parking which went better than expected! 11 Weeks Pregnant with Baby #2! How far along? 11 weeks / 10 weeks...I'm not sure anymore since our last ultrasound. I forgot to clarify this with my doctor last week but he did say that my due date was probably a bit off because of the fact that I only had two periods after having Emilia and was still breastfeeding at the time when I got pregnant. So he mentioned that he would check to see what the computer estimated I was going by the measurements of the baby. 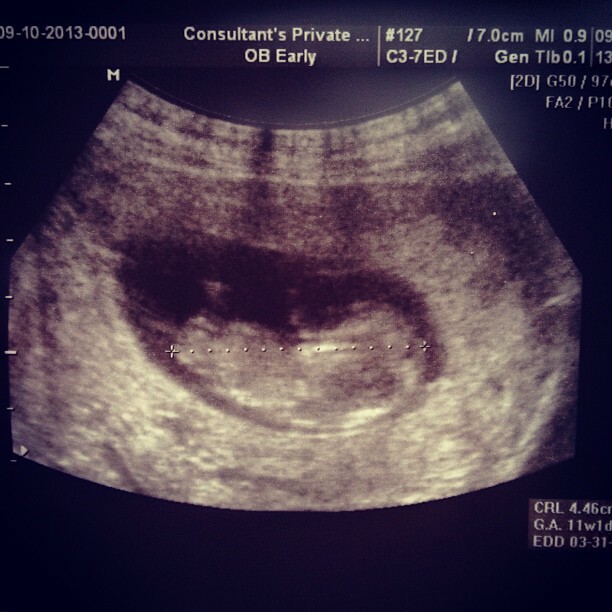 I noticed on the printed picture of the ultrasound that it had put me at 9 weeks (1 week behind) and my E.D.D. was April 1st. My doctor didn't actually say anything about changing the due date though, so I will ask him again at my next appointment whether or not it'll stay the same! Total weight gain: 1lb up from last week making my total weight gain 3lbs and putting me at 118. Maternity clothes? Yes, I'm actually wearing both maternity jeans and a maternity t-shirt in these pictures! The bump has become visible now when I'm wearing clothes and I think I look a lot more pregnant than last time at 11 weeks! Stretch marks? No new ones! Been using Mama Mio Tummy Butter every night. Sleep: Absolutely fine, thank god! Miss anything? Not really - my symptoms were not so bad this week! 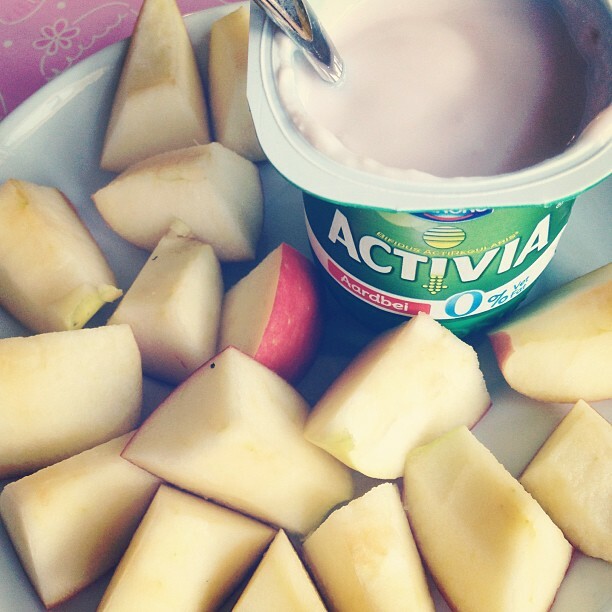 Food cravings: Again, I'm not a big fan of sweets lately (that's not to say that I haven't stopped eating them though!) I seem to be craving more savoury/salty things. Anything making you queasy or sick: I've been drinking decaf coffee this week so I'd say that I'm over my coffee intolerance! Gender: Still no idea! I've had two people who know me say they feel it's a boy, but then a lot of people online are saying it looks like a girl...who knows really?! 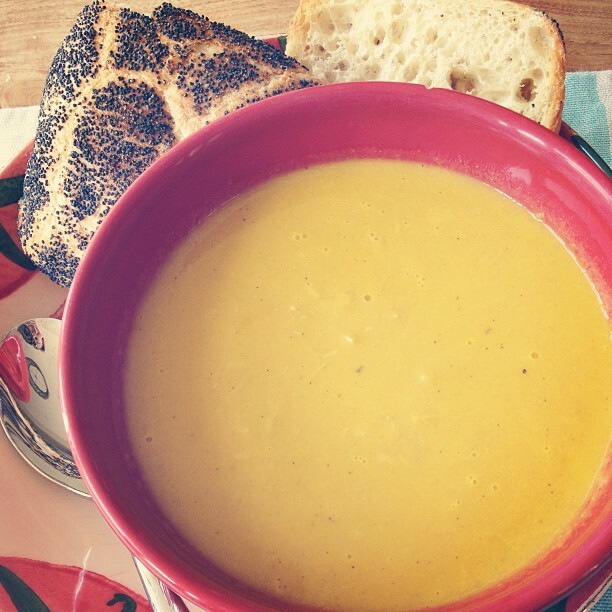 Symptoms: The morning sickness thankfully seems to be gone - woo hoo! But I don't have all of my energy back yet...at a certain point in the day I need a nap! I also need to eat every few hours otherwise I get cranky (I think I mentioned this last week). Some weird things I've noticed compared to the last pregnancy...my nails keep splitting whereas last time they grew extremely fast & strong! Also my skin is not breaking out half as much as it was last time. My leg hair has not stopped growing (this was a HUGE perk of my first pregnancy...unfortunately I didn't get that lucky this time around!). Happy or moody most of the time: Depends on the time of day and whether there's food in my belly! Ha ha ha! 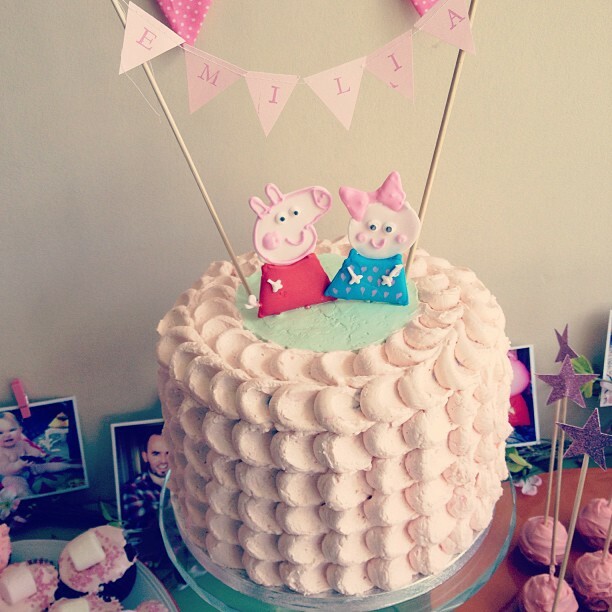 Looking forward to: Emilia's 1st birthday :) And our 12 week ultrasound next week. 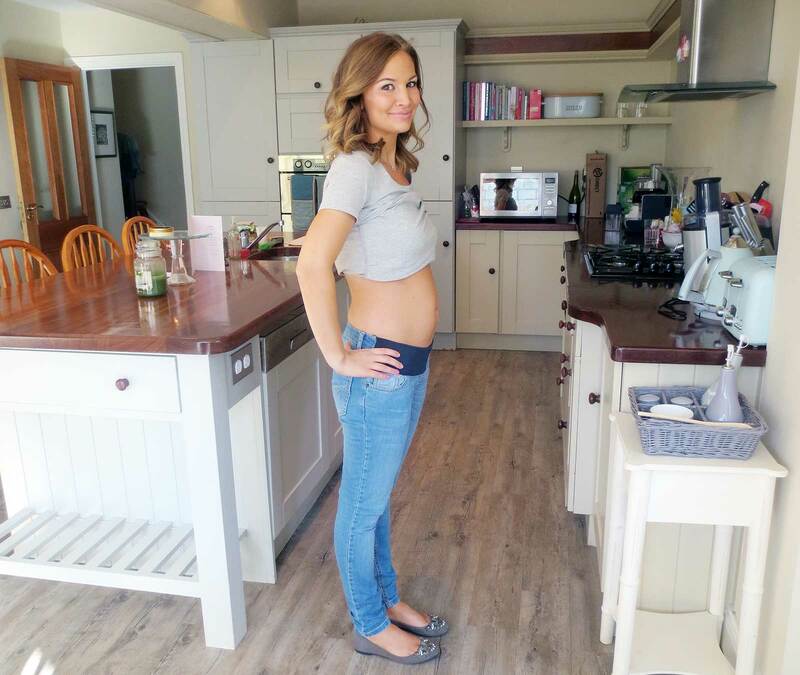 If you want to compare this bump to my last one at 11 weeks, click here! Happy 2 years to my amazing husband Jonathan! 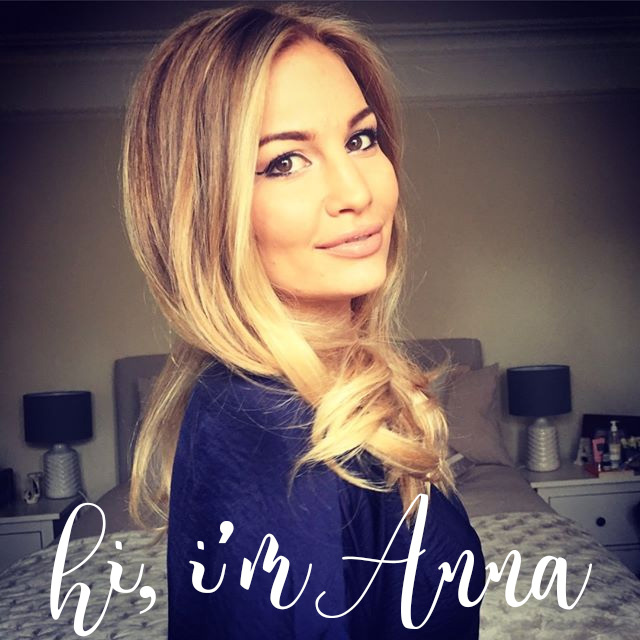 I can't believe how much our life has changed since this time last year...we didn't even know Emilia then (although I was heavily pregnant and more than ready to meet her!) and now she is this wonderful little person that I can't imagine being without! What's even crazier is that there's another little person in my belly, who will hopefully be featuring in our 3 year anniversary shot! I also love that my hair is completely different and Jonathan has lost so much weight! I'm really happy we decided to carry out this tradition of taking a picture holding the framed photo from last year every anniversary...I think these will be so much fun to look back on! Emilia's outfit is all from Boots Mini Club and the bow was a gift from a subscriber. She actually met her twin at the food fair - another little baby who was wearing the same thing! I hope you are all enjoying a relaxing Sunday, and Happy September! I hope to blog everyday this month...so don't be afraid to keep me in check!